Background photo by Alexis Dworsky. Mark Newby was a shopkeeper in Dublin, Ireland, in the 1670s and came to America in November 1681, settling in West Jersey (today’s New Jersey). He brought with him a quantity of copper pieces, of two sizes, believed by numismatists to have been struck in Dublin circa 1663 to 1672. These are known as St. Patrick coppers. (Alternatively, they may have been struck for circulation in Ireland by Pierre Blondeau to fill an order made by the duke of Ormonde, but this has not been confirmed.) The larger-sized piece, called by collectors a halfpenny, bears the arms of the City of Dublin on the shield on the reverse. The smaller-sized piece, called a farthing, does not. Although neither bears a denomination, these are designations traditionally assigned by numismatists. Both sizes have reeded edges. Newby became a member of the legislature of West Jersey, and under his influence the St. Patrick coinage was made legal tender by the General Assembly of New Jersey in May 1682. The legislature did not specify which size piece could circulate, only that the coin was to be worth a halfpenny in trade and that no one would be obliged to accept more than five shillings’ worth (120 coins) in one payment. Some numismatists believe the larger-size coin was intended. However, many more farthing-size pieces are known than halfpennies, and numerous coins of the farthing size have been excavated by detectorists in New Jersey, while none of the larger coins have been found this way. Most numismatists believe that the smaller-sized piece was the one authorized as legal tender. Copper coins often circulated in the colonies at twice what they would have been worth in England. St. Patrick farthing New Jersey, BN (Regular Strike). Image by PCGS CoinFacts. Hover to zoom. The reverse of the farthing depicts Saint Patrick holding a metropolitan cross in his left hand while driving away serpents. The inscription reads QUIESCAT PLEBS (“May the People Be at Ease”). St. Patrick halfpenny New Jersey, BN (Regular Strike). Image by PCGS CoinFacts. 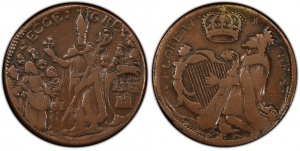 On the contrary, the reverse of the halfpenny depicts Saint Patrick in a different light: He holds a trefoil in his right hand and a crozier in his left while being surrounded by a group of people. The inscription of the halfpenny reverse reads ECCE GREX (“Behold the Flock”). 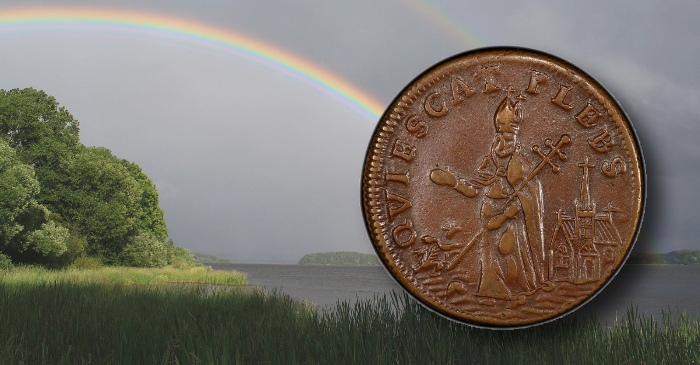 Which coin (or both) do you think was intended to be the true representation of Saint Patrick in the American colonies? Let us know in the comments, and have a Happy Saint Patrick’s Day!